The Hot News among English Language Arts teachers this summer (it’s been a slow news cycle) was the initial publication of the Common Core State Standards. Originally announced on June 1, 2009,the initiative’s stated purpose was to provide a consistent, clear understanding of what students are expected to learn, so teachers and parents know what they need to do to help them. And for those of us who teach Shakespeare, the really good news was the inclusion of a Shakespeare play–specifically Macbeth–as a requirement in the Grade 9-10 Standards. 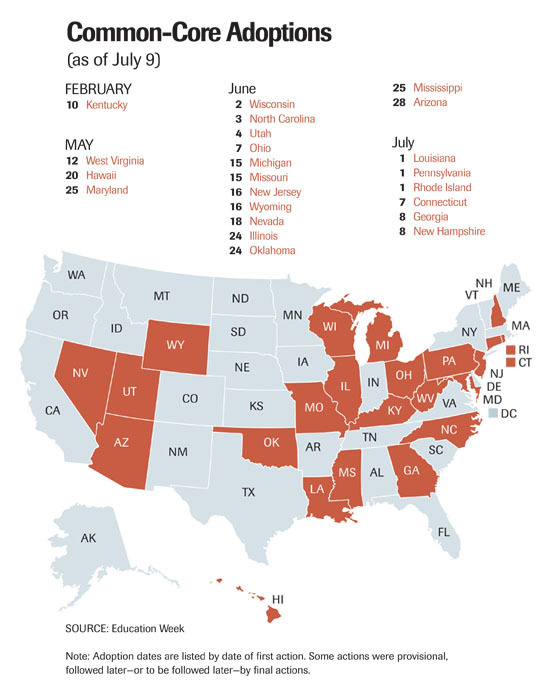 As of July 9, 23 states had decided to replace their standards with the Common Core and by the end of the year, 41 states are expected to have adopted them. Only Texas and Alaska did not participate in the initiative and are not expected to adopt them. But Shakespeare was one of the few authors mentioned by name, and the Folger has lots of fabulous lesson plans on Macbeth and a wonderful DVD of the production we produced on our stage. So what do you think about these standards? Will your state be adopting them? Will it finally convince some reluctant administrators that Shakespeare should be taught in high school? You tell us. It didn’t take teachers too long to realize that they could access all of Shakespeare’s plays in places other than books. although it took lots of them to upload the Complete Works. 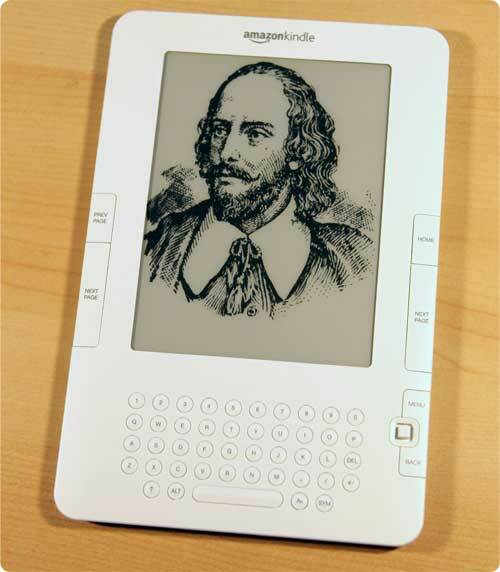 MIT Shakespeare was one of the earliest resources and many teachers still use them. I’ve discovered lots of errors on this site, so now I avoid using it. My guess is that many users are impressed by the MIT name, but that’s not a good reason to use it. Bartleby uses the 1914 Oxford Shakespeare edition which is in the public domain as its source. Its advantage is that it has line numbers. Shakespeare Online has lots of extra features and lots of annoying ads. Open Source Shakespeare is based on the Globe edition and in addition to the plays, includes a concordance, keyword and advanced searching, and statistics. The Works are available in HTML editions from Wikisource, without version attribution. PlayShakespeare.com calls itself “the ultimate free Shakespeare resource,” and is primarily a presentation of the texts with some ancillary materials. The Complete Works from the etext library at the University of Adelaide. The Project Gutenberg texts of the Complete Works are also available. And my personal favorite–though it doesn’t allow you to access the complete plays–is Shakespeare Searched. It’s the perfect tool for teachers. Now tell us which source you use most. A few years ago, we put together a poster of words and phrases that Shakespeare is credited with having used first in his plays. These included, “as luck would have it,” “vanish into thin air,” “too much of a good thing,” and so on. When we gave the poster to teachers, they looked at it and noted that we forgot to include some of their favorites. “Too many to include on one poster,” we responded. Well, we’re looking to create a new poster, so here’s your chance to let us know the ones you think we should include on it. But, before you do, consider that “green-eyed monster” and “dead as a doornail” are already taken. So, send us your favorites, but give us some “elbow room” so we’ll be able to “budge and inch” when we look at your choices. Rest assured, we won’t get them all in “one fell swoop,” and they’ll be no “foul play … for goodness sake” when we make our final selections. And we won’t act “without rhyme or reason.” What are your favorites? 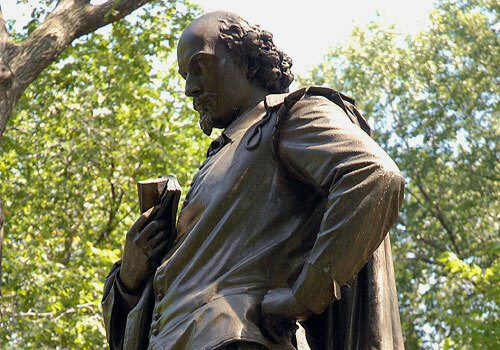 Shakespeare's statue in Central Park was the first sculpture of a writer to be placed on the Mall, known informally as Literary Walk. Edwin Booth assisted in the design. In 2007 the Folger offered an exhibit about Shakespeare in American Life. One of the focuses was how Shakespeare has been taught to American students since the colonies were founded. You can listen to the podcasts related to this exhibit through that link, or on iTunes. Originally, passages from Shakespeare’s plays were placed alongside passages from other sources and students were meant to memorize them. Those passages were not put into context of the play which they were from, instead students would simply memorize “Friends, Romans, Countrymen…” and move onto memorizing Genesis. In the 350-ish years since then, educators have discovered that performing his work is the most effective way of teaching it. Instead of memorizing the speeches, students are performing whole scenes aloud, or even whole plays. How much context is necessary when introducing a play? Should the whole story be laid out before reading the first word? Should each scene be explained before saying one line from it? Or, in reverse, should the scene be read then reviewed for the plot? Is reading a whole play necessary, or are just the “interesting parts” ok? I aplogize for the multitude of questions, but what works best for your class? Please leave comments, and enjoy the long weekend (or your continued vacation) for Independence Day!